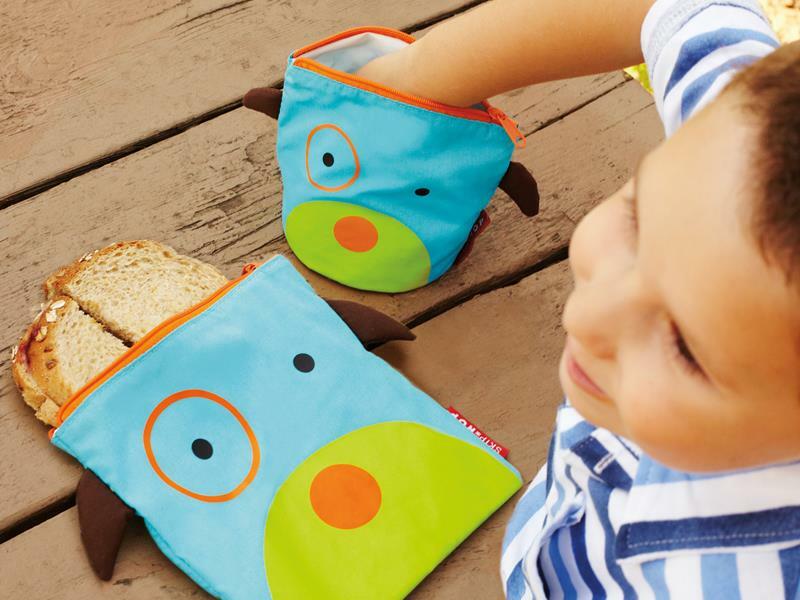 The newest addition to Skip Hop’s much-loved Zoo collection is the useful, reusable Zoo Sandwich & Snack Bag Set. This eco-friendly set of bags includes a sandwich sized bag plus one bag for smaller snacks — perfect for lunch boxes or on-the-go snacking. The snack pouch even stands up on its own and includes a side handle designed just for little hands, so kids can carry their own snacks. Other features include a zip top to control spills, a food-safe water-resistant interior, and both bags are BPA-free, PVC-free and phthalate-free. The bags are available in the popular Bee, Dog, Ladybug, Monkey and Owl characters that are already part of the Skip Hop Zoo line and coordinate perfectly with Skip Hop Zoo Lunchies. The newest addition to Skip Hop's much-loved Zoo collection is the useful, reusable Zoo Sandwich & Snack Bag Set. This eco-friendly set of bags includes a sandwich sized bag plus one bag for smaller snacks -- perfect for lunch boxes or on-the-go snacking. The snack pouch even stands up on its own and includes a side handle designed just for little hands, so kids can carry their own snacks.� Other features include a zip top to control spills, a food-safe water-resistant interior, and both bags are�BPA-free, PVC-free and phthalate-free.�The bags are available in the popular�Bee, Dog, Ladybug, Monkey and Owl characters that are already part of the Skip Hop Zoo line and coordinate perfectly with Skip Hop Zoo Lunchies.